Public perception of the Police - How can it be improved? Group Discussion Ideas > General GD Topics > Public perception of the Police – How can it be improved? Public perception of the Police – How can it be improved? 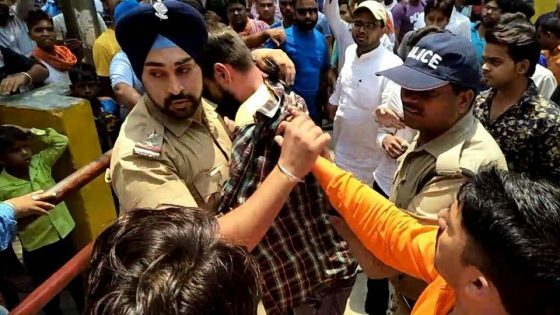 Recently Gagandeep Singh, a young daring police officer stood against a violent mob to save an innocent young man. When a video of this incident went viral, he raised the image of the police among public. In general, police do not have a good image in India. Why so? Where is the problem? What are the causes? And what can be done to improve public image of the police? Let’s discuss this in today’s topic. The main reason for the rude behaviour of Indian police is extreme stress they go through in their work life. Indian police are made to work in more than 8-hour shifts with no weekly offs. The daily life of police is filled with criminals, crimes, fights etc. On top of that they do not get time to refresh and recharge. This leads to frustration, anger and hatred towards their duties. Limiting their work hours to 8-hours with weekly off will help them to do justice to their work. In India, the number of police officials is very low considering the huge population of our country. This is resulting in too much work load for the police. Recruitment for the police stations should be done on a war-footing. Some police officers think they are superior to general public. Teaching ethics and moral values in training can eliminate this kind of attitude, and thereby raises the public trust in police system. Few bad police officers are spoiling the name of Indian police by demanding bribes and doing other illegal things. Punishing them immediately will cleanse the department, and will increases public faith. If any official do not file FIR (First Information Report), he/she should be punished immediately. In majority of our movies, police is shown in a negative shade. In some movies, thieves are depicted as heroes and they make fun of police characters. Movies effect our perceptions, especially in India because here many people are crazy about movies. These kind of movies diminishes the value of police among public. Indian police are not equipped well when compared to developed countries. Infrastructure should be improved to let police perform their duties. As Indian politicians influence the transfers and careers of police officers, they are forced to obey politically powerful people. This is a big obstacle for Indian police to work honestly. Making them immune to the influence of politicians will empower police. It should be made compulsory to respect police officials irrespective of their level in the department. Right now, police officials in lower levels are not being treated well by their superiors. And some politically powerful people do not give respect to police and treats them like their servants. This makes people feel like police work only for powerful people and not for common public. If everyone including ministers start treating police well, their image will be raised among public. At present, many police officials are forced to provide security to VIPs. Unlike in other countries, in India there are many VIPs that ask for personal security. This is a huge burden to Indian police department as it already has staff shortage. Police are appointed to protect common public and not just for powerful people. Government should cut down the number of police officers allocated for personal security of VIPs. Honest police officials do not get enough recognition for their work. Instead they get transfers and threats. If police department starts giving awards and incentives to the best employees, more and more police officers will likely to do their duties well. There should be a rating system for police stations. This will create a positive competition among police station. Rajasthan state government already implemented this. Police officers are very passionate and enthusiastic when they join in the service. But their work environment is dehumanizing them and is hampering the efficiency of Police department. If Indian government addresses the loopholes in Indian police department and encourages honest officers, the department will be cleansed and public image of the police will be improved. Afterwords :- What are your thoughts on this topic? Do you know any other ways to improve public image of police? Join in the group discussion by sharing your opinion in the comment section below. Subscribe to our blog to read answers to trending GD topics. to do this, first of all we have to remove the fear of police from our heart & we all know they are for our security but we don’t assume it. ya there are some police officials are there who do the things in wrong way & meanwhile they should be punished. some rule & regulations needs to be changed to make policemen do freely…without any political pressure. India is an ancient country with spiritual good will. So all persons should be polite, civic oriented and socially committed, including police/army. According to me Indian police they don’t have freedom to work freely they are biased by the political leaders.They work like their servant . If somebody made crime police got the information , victimised people want to lodge FIR even they don’t want to take any complain because of he is under banner of rulinng political party or he is hand in glove with political leaders, so police their hands are tied they are not able to take any action. If some police officer wants to take action for his personal humanity may be he has transfer or any other problem in their service life I e they have to instruction of political leaders. If there is any outrage of common people in some matter that time they have no choice political leaders they have to give instructions to take action for save their chair. Secondly giant number of police required for minister security after that they are not able to provide service to the common man. Police should get freedom that they can work as per their choice what is wrong they will take action against the accused person and innocent people will get justice. Police have to focus on their area and do some cultural activity in rural area at least once every month, so that the image of police in public will become more better. they are also humans and as we need some rest to get back to our energetic levels, they also need the same. so i think more recruitment should be done in order to lower the work pressure.